Create a guest list – Send out an email invitation and place everyone on a group email thread to help coordinate everyone’s schedule. Depending on the number of dad you plan on teeing up with, finding one day when everyone is free can be quite the challenge, so always start by planning ahead. Having a group email or messaging system going allows everyone to communicate and settle on an itinerary. Select the date and course – Do some research and see what price packages are available around your local courses. Consider the conditions of the course and the weather reports for the area to assure that your plans go off with out a hitch. After selecting a date that works for all of your friends, evaluate the cost and book a tee time. 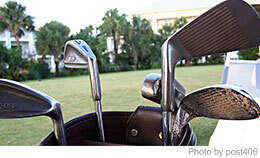 Grab your gear – Make sure you have what you need to hit the course! Ready the golf shoes and grab an extra bag of balls to throw in with your clubs. Other essentials include sunscreen, sunglasses, visors, golf gloves, tees, a gold towel, and more. Being overly prepared can save you from coming up empty handed on the green when something unexpected suddenly comes up. Plan for food and drinks – If your course allows it, bring a few drinks and snacks to get you through the 18 holes or if they provide refreshments of their own make sure to bring cash for payment or tips. And after 18 holes you’ll probably want to sit down and relax over a full meal or a round of drinks, so check out if the course offers any recommended restaurants. And last but not least, have fun! Even if you’re not quite ready to go out with the pros, remember that this is a trip about having fun and catching up with friends. To make this amore regular tradition and a competition that everyone takes seriously, consider increasing the stakes by assigning a trophy or award for the winning golfer.